Home :: **** Ceramic Order & product info!!! **** Ceramic Order & product info!!! As stock comes into OzMosaics it is listed in the Mosaic Web Store and it often goes "fast". If you desire an item that is listed as "out of stock" please email [email protected] and put in an order. Orders may take up to 3 weeks depending on demand. Ceramic artist, Flora says, "my favourite part in ceramics is the pouring & making the items. It is like opening a Christmas present every time I open a mold & a wonder to me that I have made it, fascinating. The beautiful flowers, petals and leaves that I hand craft (no mould) are my speciality and I stop adding petals and "tweaking" when the flower tells me too..."
Mosaic artist Sandy says, "it's wonderful to have these exquisite ceramics to include in my mosaic art, I continually find the colours and texture beautiful to work with". We are very fortunate to have this beautiful ceramic tesserae available and hand made in Australia. 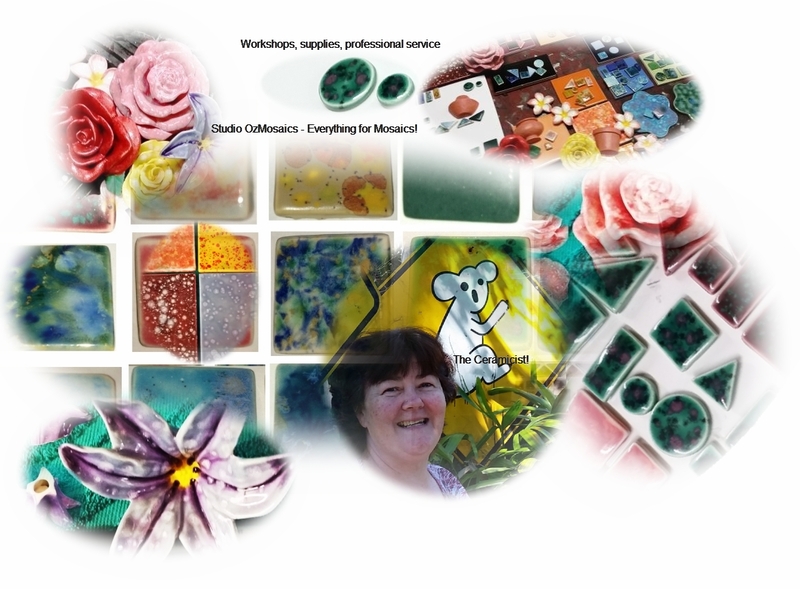 I have great joy creating ceramics and supplying OzMosaics with a mosaic range; a mix of hand made and poured from a mould - ceramic flowers, petal, leaves, tiles and pots and more. The clay used is Duncan's Laguna with a mixture of brands for the glazes, underglazes & translucents paints. Before pouring commences, the molds have to be cleaned using an air hose, brush & other tools as required then strapped tight so no leakage of clay. The mold is topped up with wet clay until the desired thickness, then the mold is emptied leaving the shell or actual item. The piece needs to dry somewhat in the mold before it can be opened but not too long as it can crack as it shrinks. While the piece is wet, it can be carved into pieces or have cut outs done such as windows on a house. Once the item is removed from the mold it needs to dry further which is known as leather dry, then is has to be cleaned by hand using sandpaper, wet sponge & tools to perfect the edges & shape -- then they are fired for approx 8 to 9 hours which is called a Greenware Fire & they turn to Bisqueware. The cooling process is normally 3 times the fire time & then the pieces can be painted. When painting with glazes each piece needs 3 coats & each coat needs to be dried before applying the next which in winter time can take a while. Then they are ready for the Glaze firing which takes approx 6 to 7 hours. When a piece is glazed, it can be used for outdoors and is dishwasher safe. Sandy says: A lot of time, love, experience, talent and care goes into every ceramic created by Flora. Add some special Flora to your mosaics!